OK this post may seem a little orange for late July but I'm already getting some pumpkins on the vine and I'm a tad bit confused...So here we go....After watching the pumpkin vines grow this season, get big and take over absolutely everything????? Ummm lets just say I've come to a few conclusions... One is that yes if you throw your Halloween pumpkin out in the garden, it will indeed give you your own pumpkin patch next year??? Go figure? Two they will grow great in humid rainy weather. But three the pumpkins that are growing on the vines are very small and there already starting to turn orange? So how do you grow a big pumpkin? Lets find out? After reading some stuff on the net it seems like possibly climate is responsible for the small harvest or perhaps I'm being to impatient maybe they will continue to grow.. Patience in a virtue!!! Growing a pumpkin is easy, fun and rewarding. On our farm, our approach is a bit different than what you might read on the back of a seed packet or on other internet sites. It isn't nearly as hard as some instructions make it sound. Below you will find a wealth of basic information so you can learn all about growing pumpkins. If you want to grow a pie pumpkin Baby Pam's are a good choice. If you want to grow Jack-O-Lanterns a good variety to start with would be Connecticut Field or a Howden. If you would like to grow a miniature variety, I'd recommend Jack-Be-Littles. Some of the heirlooms can be a bit fussier, so any of the varieties I just listed would be excellent beginner choices. Good seed is an important first step. If pumpkin seeds have been stored properly, they can last for several years. I've even read where one fellow had 50-year-old seed germinate. Even so, if you want a high germination percentage, and healthy and vibrant plants, you should start with fresh seed from a reputable company. Try to purchase seed that is the exact variety you want, not a generic seed like you sometimes find at big box stores or bargain seed at drugstores that just read "Pie Pumpkin" or "Jack-O-Lantern". If you are in climate with a short growing season you can start your seeds indoors. My experience is that plants started indoors can quickly get spindly, and aren't too fond of being transplanted. Only start seeds indoors if you absolutely must. Again, the same as with seeds, if you choose to purchase seedlings instead of growing your own, be sure to purchase from a nursery that lists actual varieties. Many big box stores will label them simply as a pumpkin. Why go to the time and effort if you don't know for sure what sort of fruit your plant will bear? The second step is choosing an area to grow your pumpkins. First you need to choose an area that gets full sun. The vines get quite long (usually 20 - 30 feet) and need room to grow. This doesn't mean you have to have a big yard or a farm. If you have a long bed on the backside of your house or a garage, this can be the perfect place to grow a pumpkin. Your site also needs to have good drainage. If water stands during the rainy season in the soil strip alongside your garage, this won't be a good place to grow pumpkins. If your soil has been used in the past to grow flowers, a vegetable garden, or even a lush patch of weeds, then it will be suitable to use for planting pumpkins. If you have compost available, work some into the soil in the area you will be planting to create a nice seed bed environment. Contrary to what you read on seed packets, pumpkins don't have to be planted in a mound of soil. On our farm we actually place the seed on the bottom of long narrow ditches. The exception for mounding would be if you live in an area that has frequent rain during the summer months, and/or your soil has poor drainage. Mounding can help prevent some diseases caused by the soil being continually wet around the stem. In California we thankfully don't have those problems. Choose a spot in your garden or flower bed where you can plant your seed roughly at the center of where you expect the vines to spread. We get quite a bit of wind on our farm. Wind can be really hard on pumpkin leaves and vines. To mitigate this we plan our vine rows so they grow in the same direction as the wind. If you have a lot of wind, and you are planting in a spot that isn't protected, you might want to consider planting your vine rows based on the wind direction. You can also put up shade cloth or temporary fencing to help protect your vines. time for Halloween, and may be damaged by fall frosts. backwards to decide when to plant. Plant your seeds 1 - 2 inches deep. Don't worry about which end is up. The plant will find its way to the surface. Your seeds should sprout in 7 - 10 days. Once your seedling sprouts is a good time to add additional compost around the plant. The compost will help to keep weeds down and retain moisture. Again, if you don't have compost, don't stress, pumpkin vines are pretty resilient. Keep it simple and keep it fun. 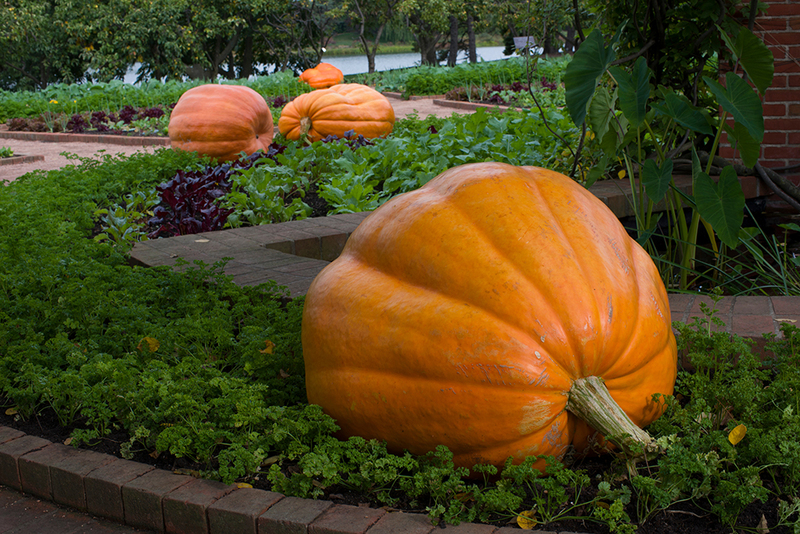 Pumpkins are about 80 - 90% water, so as you can imagine they use a lot in their growth. The secret is to only water pumpkins when they need it. Check the soil with a trowel or a hoe. As long as the moisture is good and your plant looks happy, leave it alone. When the soil is starting to dry out, or the plant starts to look a bit droopy, give it a long deep drink. Deep but infrequent watering results in a healthier plant. It is important to not get water on the leaves, and water in the morning instead of late in the evening, to help stave off fungal diseases. When your pumpkin fruit starts to turn orange, gradually decrease the amount of water. Your pumpkins will store longer if you cut off water 7 - 10 days before you harvest. When considering fertilizer we really like Organic Osmocote. It is time released, which makes it almost impossible to over fertilize or burn a young plant. Another fertilizer we have used with good success is Dr. Earth. One other secret in our arsenal is Organic Preen. It is a bit pricey, but can save hours and hours of weeding. Another important aspect to watering is to not get water directly on the plant's leaves. Almost all pumpkins are susceptible to a fungal disease called powdery mildew. Powdery mildew looks like your pumpkin leaves were dusted with talcum powder. The leaves will gradually wither and die. Sometimes the whole vine will die as a result. Some areas of the U.S. also have a problem with downy mildew. Downy mildew first shows itself as yellow or light green patches on your leaves. The bottom of the leaves will have a gray fuzzy mildew developing. These patches will turn black and the leaf will die. A warm moist environment encourages mildew growth. Keeping water off of the leaves, and watering in the morning instead of late in the evening, can help stave off this disease. If you have a bad outbreak of powdery or downy mildew, it can kill your vine and affect crop quality and production. If you do develop one of these fungal diseases, there are several different organic products you can use. Use caution using baking soda or other home remedies as improper ratios can do more harm than good. Check with your local garden center and read labels to find the product right for you. Pests: Aphids & Beetles & Bugs . . . Oh my! We have four main pests on our farm. Cucumber beetles, four line bugs, squash beetles and aphids. Striped Cucumber Beetles: Cucumber beetles look like neon green ladybugs. They are very bold, can be very prolific and do a lot of damage in a short period of time. Their favorite things to munch on are new bright yellow blossoms and leaves. Four Line Beetles: Four Line beetles are a bit more timid. Their name comes from the tiny parallel lines on their backs. You may not even realize at first that you have an infestation. They tend to congregate around the stem of plants. They eat the plant tissue and can kill young plants. I frequently have seen them in large congregations on the underside of young tender pumpkins also. Squash Bugs: Squash Bugs are much bigger than the beetles. They look like they are wearing mini armor and have a shield shape on their backs. They are usually a grayish black color with orange edges. They can dart and hide really quickly. Aphids: The pest that quietly sneaks up on you is aphids. The first indication you may have of an infestation is that the tender young leaves start curling. Upon close inspection you will see thousands of these tiny insects sucking the sap from the back side of the leaves. They can do a lot of damage to female blossoms too, and decimate the emerging fruit. For aphid control in a small garden I've had some good success with a strong spray of water. It dislodges the aphids and somehow disrupts their organized ravaging campaign. This intermission usually gives our lady bugs a chance to catch up. If you have a small garden you can control most beetles and larger bugs by picking them off the vines one by one and dropping them into a coffee can or jar filled with soapy water and ammonia. To help lower populations, in the fall we compost or till under plant material so the beetles don't have a protected spot to over-winter. We also keep our fence lines clean and weed populations hoed or mowed. We plant rows of sunflowers near the pumpkin patch to work as an attractant crop. We time it so the sunflowers bloom a little in advance to the pumpkins. The cucumber beetles flock to the bright yellow sunflower heads. If the population is low they will tend to stay on the sunflowers and you won't see a lot of damage to your pumpkin crop. You may have to resort to a pesticide. We try to use eco friendly organic products such as those made by Dr. Earth. If you need to spray your pumpkins try to do so in the early evening after the bees have headed back to their hives. The bees are only interested in the pollen, and the blossoms are only open for one day, so the bees won't come in contact with the spray on the leaves or outside the blossoms. helps to establish a pattern for the bees to find your pumpkin patch. You can see why bees are so very important for both small backyard growers and large pumpkin farms. Without bees, gardeners and farmers would have to hand pollinate each blossom or there would be no crop. When a female blossom opens, it is only for one day, and depending upon the weather, it may only be open for a few hours. If a bee or other insect does not transfer pollen from the male to the female, it will fall off and die as it was not fertilized. A few weeds is not a problem. A lot of weeds can be a big problem. Weeds directly compete with your pumpkin plant for water and for nutrients in the soil. Some weeds also can be a host for diseases or bug populations. A product you can use after your pumpkin seedling sprouts and has 5 leaves is called Organic Preen. When applied around your plant it can keep additional weeds from germinating. You can also apply compost around your plant to discourage weeds. Be sure that your compost is fine, as large chunks like wood bark can serve as a home for pill bugs (sowbugs), earwigs, four line beetles and other unwanted pests. If you have lots of weeds, it is time to get the hoe out. Once the vine starts to grow in size, the large leaves help to shade out small weeds that may germinate later. There are many indications that your pumpkin is ready to harvest. A Jack-O-Lantern variety should be predominately orange in color. If the vine has started to "go away" (meaning dying off and declining) this is another signal. Sometimes the stem is already starting to twist and dry. The most important indication to look for, is that the shell has started to harden. If you can easily indent the pumpkin skin using your fingernail, the fruit is still too immature to harvest. If you harvest it at this stage, your pumpkins will likely shrivel and spoil within days. When the shell has hardened, your pumpkin is ready to cut from the vine. Use shears to cut the stem. Leave the stem as long as you possibly can. A six inch or longer stem is a very fine thing indeed. Never pick up a pumpkin by its stem. The stem can break, and if broken at its base it will rot quickly. Most champion pumpkin growers have their own methods and secrets for producing the gigantic pumpkins that win pumpkin contests every year. Of course it is necessary to start with the right kind of pumpkin seed, one that is selectively bred to produce the really big pumpkins such as "Prizewinner Hybrid" which with the proper growing methods can produce pumpkins in the 300-pound range. CulturePumpkins need a lot of sun. Choose the sunniest place you have; remember that pumpkins are sensitive and will need shelter from wind and frost. Try to protect pumpkins from the worst of the elements by covering them during heavy rains, or putting up some kind of barrier to protect the vines from high winds or using shade tents during summer’s hottest days. PlantingWhen seedlings have the fourth or fifth leaf, set them outdoors in hills about the size of a pitcher s mound, one plant to a hill. Protect pumpkin seedlings the first few weeks with plastic-covered frames. Space each hill at least 20 feet apart. GrowingThis is just the beginning of a summer of long but rewarding work. What you have started is actually a pumpkin-producing factory. Remember that there are 100 or more leaves to each vine and if you are trying to grow a 300-pound pumpkin, each leaf is responsible for up to four pounds of weight in your pumpkin. Every leaf, every stem, every hair roots is now receiving sunlight, absorbing water, and blending nutrients. All are traveling down the all-important stem to your prize pumpkin.